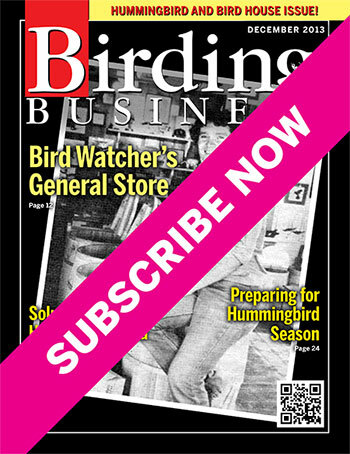 After delivering Birding Business Magazine free to anyone who requested it for almost twenty years, the company has announced the publication will change to a paid-subscription format starting immediately. The realities of the business climate are taking a toll on all printed publications and sooner or later all will have to charge for subscriptions or raise advertising rates to a level that will scare advertisers away. We know that a great many of our readers still prefer a paper version and we will continue to provide it so long as it remains viable. The December issue has been printed and will mail in the next few days. Everyone who has been receiving it previously will still get this issue, but a subscription will be required in order to receive future issues. Download and mail the subscription form or send in the subscription card included in the December issue.